The Libutti family, many of whom still live and work in the Huntington area, are among the most respected and well established families in Huntington. 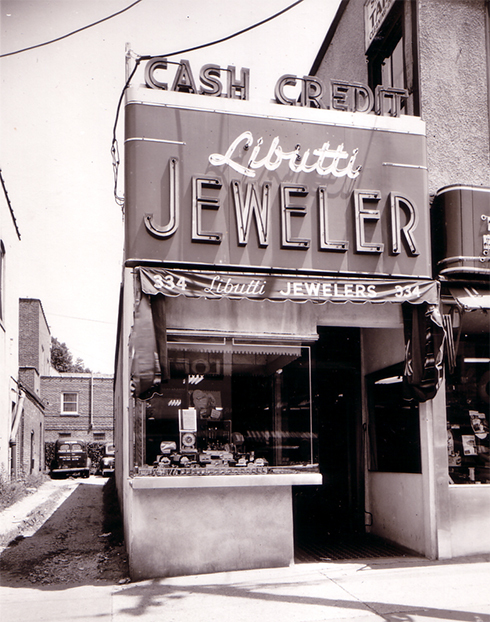 Libutti’s has been serving generations of customers with gorgeous jewelry, gems and wonderful timepieces for over 70 years. Some of today’s customers were only children when their mothers first brought them to pierce their ears at their hometown jeweler. A full service jewelry store, Libutti Diamond Jewelers specializes in custom designs, repairs, appraisals, extensive watch expertise as well as a dedicated sales staff and expert gemologists and jewelers. Our Impressive selection now includes designers such as Tacori, Verragio, Simon G, Scott Kay, Steven Webster, and many more. Our timepiece selection is one of the largest in the area, with such well known designers as Breitling, Oris, Michele, Luminox, and Philip Stein. Our diamond selection, features GIA and AGS certified diamonds. Master jewelers craft beautiful items to guests’ individual specifications. We can make just about anything you can imagine in-house with our state of the art LASER and CAD CAM technology– from scratch – for one-of-a-kind engagement rings, anniversary bands and more. Exceptional service has been a cornerstone of Libutti Diamond Jewelers’ success. Seasoned sales associates provide invaluable guidance in helping guests select the right pieces for their needs and budget. Stop by to add a little sparkle to your day! Rewind back to a time when everyone in Huntington knew one another by name. My father, Mario Libutti, wanted to become a contractor. One day, while tending to a few small repairs on his mother’s home, he fell from the roof, two stories to the ground. Mario’s back was broken in several places. He had a long road to recovery ahead of him. At the time, my father was dating my mother Rose. She came from a strict, old Italian household. My grandmother insisted that Mario could not marry Rose as he would ever be able to support her. As a result of his accident, my father had to abandon his dream of being a contractor and find a job where he could sit. He began repairing watches in his mother’s kitchen. He became excellent at his skill and eventually opened Libutti Jewelers in town. The store prospered. People often inquire about Lieutenant General Frank Libutti (Ret.) for whom one of our local streets was renamed. Frank went to St. Anthonys High and later graduated from The Citadel before going on to become a highly decorated Vietnam war veteran having received the Silver Star, the Purple Heart and later the Navy and Marine Corps Commendation Medals among many others. Frank was the youngest Marine in history to achieve the rank of General and at the time of his retirement as Lieutenant General in 2001, was the Commander, U.S. Marine Corps Forces/Pacific/Commanding General, Fleet Marine Force which basically put every active Marine to the West of the Mississippi under his command. After his retirement, Frank became the first New York City Counterterrorism Commissioner before later being tapped by President Bush to become the Under Secretary for Information Analysis and Infrastructure Protection for the newly formed Department of Homeland Security under Director Tom Ridge. We take great pride in Huntington and we are thankful for being in a position to give back.